Kiel Utilities maintains an electric distribution system that services over 2,700 customers in the City of Kiel, as well as the Townships of Rhine, Schleswig, and New Holstein. Our normal business hours are 7:30 a.m. to 4:30 p.m.
*This is the Manitowoc County Non-Emergency Dispatch line. After reporting the outage, they will contact our City employees. Kiel Utilities would like to remind you that when you are planning projects that require any digging or excavating, there might be underground utilities that could be affected. If you are planning a project, please be proactive and contact Diggers Hotline 800-242-8511 to have utilities located and marked. Saving energy saves money. In partnership with 107 Wisconsin electric and natural gas utilities, Focus on Energy works with businesses, farms, school districts, local governments and other property owners to install cost effective energy efficiency and renewable energy projects. Want to get started? Check out the links below for various incentive programs offered! If you would like more information on these programs, visit the Focus on Energy website. Below, you will find various electric forms for the City of Kiel. 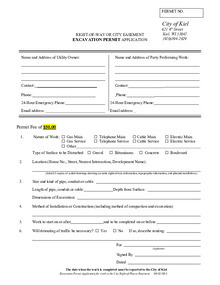 Currently, we require forms to be completed for electric service requests, right of way excavations, as well as tree trimming. Once completed, all can be returned to the Utility Office in City Hall (621 Sixth Street). Similarly, any fees associated with the forms can be paid in the Utility Office. If you have any questions please call (920) 894-2909 ext. 105, or stop in at the Utility Office. Please return this signed form to the Kiel City Hall. 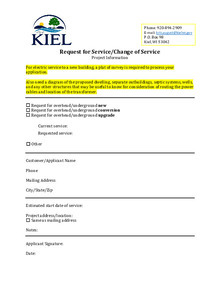 Download "Request for Service (1).pdf"
Please return this signed form with the fee to the Kiel City Hall. Please return this signed form to Kiel City Hall. Our tree trimming standards and work practices can be found in the file below. 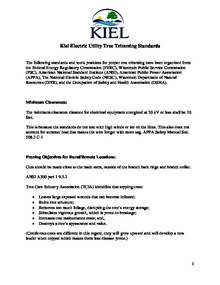 Download "Customer Waiver - Tree Trimming.pdf"
This document outlines the standards and work practices for proper tree trimming that Kiel Electric Utility employees follow.